After splitting from his ex-wife Gaile Lok (樂基兒) in 2012, Leon Lai’s (黎明) love life has been lackluster. Earlier, it was reported that Leon is dating his assistant, Wing Chan (陳泳儀). The 32-year-old became an overnight sensation for allegedly winning the heart of the only Heavenly King who was still single. Not long after the rumors of their relationship surfaced, news spread that Wing is already six months pregnant. True to his word, Wing has not been spotted publicly since. Leon is a successful investor in real estate. 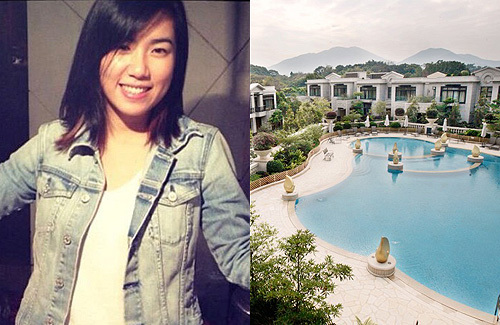 An insider revealed that Wing has moved into Leon’s property in The Royal Oaks, which is allegedly worth $50 million HKD. The location is less than a five-minute drive from Leon’s home, conveniently allowing for Leon to visit and take care of her. Now she can concentrate in being a doting mum and caring wife. Idk but this sounds like a business relationship more than a loving relationship. No mention of being in love with her or marriage and why live separately? @passingby it sounds kind of strange that she is staying in his apartment instead of moving in WITH him. they have already passed the stage of courtship and will be parents. why are they not living together? @janet72 This property in Royal Oaks may offer more privacy for Wing than Leon’s own home? The surroundings seem very peaceful. That is the only reason I can think of as to why Leon situated Wing there, instead of asking her to move into his primary residence. He can still visit her on many nights. As to whether there will be a wedding, that may happen after the baby is born.